Posted: Tue 11 Oct, 2005 4:34 pm Post subject: Poleaxe: Trial by combat weapon only? Was the Poleaxe mostly a " Judicial trial by combat weapon " or used as a Knightly polearm on the battlefield ? I would also wonder if Knights would at times use other polearms or would most of these be considered by them good only for their social inferiors ? I think the regular spear or a cut down lance would also have been used by Knights. I would think that a Knight who had an affinity for using a Halberd might have one made of better than " peasant " or " foot soldier " quality in both matterials and decoration. The surviving polearms I have seen in books seem to be either highly decorated later types or very crude peasant weapons: I don't remember seeing many that would seem like serious weapons but at the same time obviously made for the Knightly class. Posted: Tue 11 Oct, 2005 5:57 pm Post subject: Re: Poleaxe: Trial by combat weapon only??? I am aware of several 14th c depictions of warriors on foot carrying what one might call pole axes., so I will speculate that pole axes were not specifically and only used for judicial combat. As the pollaxe is usually of high quality and ornate (without, however, losing its strength); it is associated with and documented as being a weapon of the aristocrat, in contradiction to almost all other staff weapons. The rare surviving and less ornate infantry version was still no match for the halberd, although its shorter length gave it good maneuverability." Of course there are always exceptions to everything. Your review of the A & A Poleaxe is what got me thinking about this were you mention the use of Poleaxes mostly for judicial duels. Could be wrong but I thought that the French were armed with Poleaxes and / or spears when they attached on foot at Poitier or Crécy ??? All the scholars out there with better memories than I have please feel free to correct me. The argument against the Poleaxe in battle compared to a Halberd makes sense to me, leading me to my other question about Knights using a Halberd or Bill etc........ In a major battle if forced to fight on foot. Although, a Poleaxe might be advantageous fighting in the relatively close quarters of the inside of a Castle when defending or attacking a breach. As with any shorter weapon, close in, the Poleaxe might have the advantage of manoeuvrability over a longer polearm. I thought it might have. Too much of a coincidence. I'm glad SOMEONE is reading those things. It seems like I recall that mostly the French knights shortened their lances for use as spears but I've no doubt if someone had a pole axe they might have hauled it along. Notably the English didn't typically use halberds preferring the Bill. According to Waldman most halberds range from the downright crude to some extremely well made example however very few if any exhibit the sort of decoration that one would associate with a noble. It is only to be expected that nobles would disdain polearms in general (the pollaxe being the exception). The pole arm was a vulgar weapon the weapon of the peasantry. A noble knight used lance and sword from horseback. Of course eventually it was these polearms along with projectile weapons that ended the dominance of the knight on the battlefield but the knights were sort of slow to catch on. Wasn't it because of Knightly conservative stupidity and pride that the Hussites could count on the Nobles to attack their war wagon in predictable ways guaranteeing their defeat ! Send a few men to provoke the Knights to attack, retreat to your war wagons, shoot the Knight at close range with your handgonnes and small canon at point blank range: Repeat until the Knight are all killed or leave to go sulk in their castles. Well maybe an oversimplified description of these battles. Oh well maybe Knights never used Halberds or if they did only rarely as a weapon of opportunity picked up in the middle of a battle. I guess, only in my " Alternate history " Fantasy / Science Fiction imaginings I would have MY knights use whatever was useful: As in my custom A & A Langue de Boeuf I'm having made. It doen't have to be historically correct for me to enjoy something " Fantasy " but I always like to KNOW the difference. The pole/poll axe was a common battlefield weapon among the English and French and replaced the shortend lance which had been the common primary weapon in the early period. The last time I've encountered large scale used of lances shortend to 5-6 feet is at Agincourt but written and pcitoria sources suggest that poll axes, other axes and pole arms were used by the men at arms along side the shortend lances since at elast the 1380's. English men-at-arms were required to arm themselves with poll axes for foot combat by their intendures. I think that Waldman exaggerates the degree to which weapons were considered 'noble' or 'vulgar', the Bretton Nobility was ordred to equipthemselves with (poll) axes or guisarmes and the guisarm certainly was a 'vulgar' weapon if one uses Wladman's classification. The French men-at-arms used the partisan alongside the poll axe despite it's being 'vulgar'. The so called 'Caesar' tapestries amde for Charles the Bold show dismounted men-at-arms wieldign an assortment of weapons including, shortend lances, glaives, poll axes and type XV's swords held for half-swording. Diebold Schilling's chronicles has illustrations of dismounted men-at-arms wielding pollaxes and bills at Nancy and so on. English men-at-arms fighting in the Wars of the Roses never seem to have had noteworthy problems when using their poll axes against halberds or bills. At Formigny it was the English archers which gave the French men-at-arms trouble, not the billmen. While a poll axe does have a disadvantage in reach it's shortness and nimbleness becomes an advanatge in the closely packed melees of a medieval battle. Reach can be overrated in battle. the Swiss were recognised as superior pikemen even though they gripped the pike in a way which gave it a shorter reach compared to the way the Landskenchts gipped the pike. Thanks, I would imagine that a Knight if he used a Partisan, Glaive or Couteau de Brèche, or even an even more " vulgar " Halberd or Bill he would choose a well made one when possible, even more so if it was a personal weapon ? Maybe there was some sort of hierarchy of what would be considered suitable for a Knight to use? The very crude peasant weapons like a Flail or a simple club with spikes might be at the very bottom and the Poleaxe, Partisan, Glaive, Fauchard closer to the top ? Or maybe this is just our conventional thinking ( Or just Romantic notions left over from Victorian invention ? ) and just anything might have been used and taken from an armoury " munitions " arms just before a battle or taken along in a supply cart to be distributed as needed. Only the better quality weapons might belong to the personal inventory of a Knight or Noble and be of the more socially accepted kind. I.E. A Knight might just grab anything that took his fancy from the supply wagon or might use his personal Poleaxe ? It may well be as you say, even Waldman notes that there were some notable exceptions. However on the whole the lack of lavishly decorated pole arms along with the fact that polearms can't be used from horseback would tend to support his arguements? Jean I think you have more or less correctly identified Hussite strategy, although Ziska was eventually able to train his waggoneers well enough that the could even use the wagon formation or wagonbern as an offensive weapon. You are also I think correct in believing (at least according to Waldman) that there was sort of a hierarchy of weapons with the knightly pollaxe being at the top along with the vouge perhaps followed by other various and sundry with the (for the most part) morgenstern and the flail at the bottom. Again I have to put in the cautionary note that my knowledge of pole arms comes almost entirely from this one book at the moment which is always a precarious position to be in. 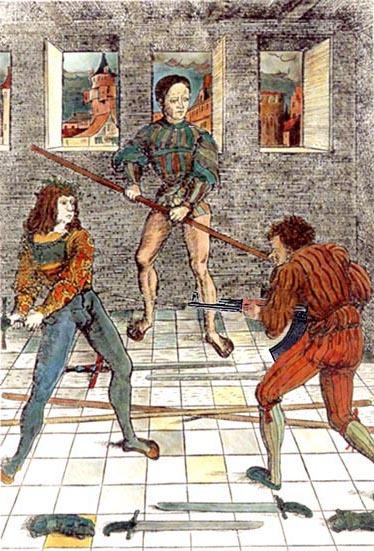 There are color illustrations of Emperor Maximillian fighting (for sport) using both halberd and flail (not at the same time mind you, although one wouldn't be surprised to find depictions of Max using both simultaneously and wielding a mace with his toes while using his free foot to kick his opponent out of his armour). The man loved a fight, and seems to have taken great pride in mastering a variety of weapons, including some we tend to think of as "peasant" weapons. See Anglo, The Martial Arts of Renaissance Europe. Aren't those right next to the ones where he is faster then a speeding bullet and leaping tall buildings in a single bound? Seriously you are right however apparently he even set up flail tournaments with leather flail pieces. However Maximillian sort of the last gasp of the knightly era wasn't he and hardly typical? However Maximillian sort of the last gasp of the knightly era wasn't he and hardly typical? Correct on both counts. To me, the interesting thing here is that the Emperor's use of such weapons suggests a certain martial practicality we don't often associate with nobility. It's a "whatever works" approach that seems much more familiar to us. Also there are A.K.s and there are A.K.s: A Yugoslav A.K. with an oldstyle machined frame or even the thicker gage pressed metal receiver is generally more accurate than the Chinese versions; should be able to give a 3" to 5" group at 100 yards or better. A very worn A.K. will still be reliable, won't jam, but might group in feet rather than inches ? Also, Finish ( Finland ) Valmets are very accurate: So the design can be made accurate. if the King like Halberds the social " Faux pas " for Knights using one no longer exists ! Using various Polearms by Noble seems maybe more common that imagined: Maybe we make things black and white when the situation is actually a grey because we like our notions of history nice and neat ??? As for the pollaxe's lack of length for fighting in the field, the five to six foot range actually seems to have been the prefered size for battlefield polearms according to at least Silver and Smythe. I also recall another 16th century English text specifying five and half foot mallets for archers. For fighting in formation I can certainly see the advantages of a shorter weapon. Exactly. Like Clark Gable appearing in a film without an undershirt or JFK appearing in public without a hat. PS: I think you know a little too much about AKs. Maybe Americans should be more worried about the northern border! Getting back to Maximillian-The halberd he's using in the aforementioned illustrations is surprisingly short, certainly under 6' and of a length I would expect for a poleaxe. It's definitely a halberd head rather than a poleaxe hammer/pick combo, and looks to be a fearsome weapon. About the battle axe, halberd and black bill he says: "In anie of these weapons there needeth no just length, but commonly they are, or ought to be five or sixe foot long, & may not well be used much longer, because of their weights..."
Silver thought partizans and glaives should be just as long as his short staff, i.e. eight to nine feet, but he doesn't suggest using them in the field, at least not in Paradox 21. And according to Waldman most original shafts ranged from five to six feet, so the overall length of some halberds might have been just above six feet.